Did you know that Bobby and former Islander favorite, Dave Scatchard, come from the same small town in Alberta, Canada? Did you know that Bobby, an avid golfer, hit a hole-in-one in 2001 while touring through the Carolinas? event: tickets were $250 each. Bobby Nystrom - From Hinton to the N.H.L. Thore Robert Nystrom was born on October 10, 1952 in Stockholm Sweden, the second child of Thor and Gunnel Nystrom. His parents and uncle immigrated to Canada eventually settling in a small pulp and paper town nestled at the foothills of the beautiful Canadian Rockies. Hinton, Alberta was a brand new town and the Nystrom family would have a great impact on it for many years to come. Bob’s Father worked at North West Pulp and Power and was active in the new town’s minor sport programs, Bob’s mother worked at the Eaton’s store in the Valley Shopping Center. Bob and his sister Annika spent their childhood in Hinton and were top students and local athletes. Bob still holds many Track and Field records in Alberta High School Athletics (A.S.A.A. Pole Vault 1967). It was while growing up on Sunwapta Drive and wearing his Toronto Maple Leafs jersey and cheering for the likes of Norm Ullman, that Bob first dreamed of playing in the NHL. A star defenceman for Hinton, Nystrom would often weave his way through the opponents’ line-up just to pass off to a teammate on an open net. 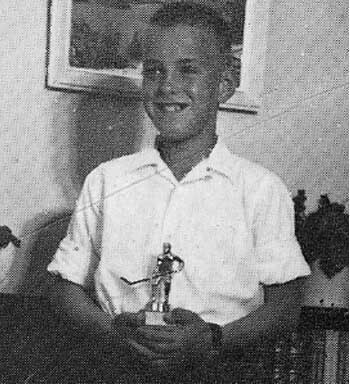 Already, at seventeen, he was the elite player in the Pembina Minor Hockey League and Bob and a friend decided to try tier II hockey in British Columbia, as none was available near home. Bob stayed two years with the BCJHL Kamloops Rockets alongside Grande Centre’s Garry Howatt before being selected by the grizzly and bombastic coach of the Calgary Centennials Scotty Munro. In Calgary , Bob enjoyed playing alongside Jim McMasters and future Ranger goaltender John Davidson. Coach Munro thought Bob would probably be a very successful minor league player but did not see a bright future in the N.H.L. for Bob. The Islanders were not certain in the beginning either. The Hammer of Thor they called him during those early expansion years; Nystrom may have been an awesome fighter and possessed a booming shot, but he had not earned a full roster spot. He couldn't skate at NHL speed and needed help with the mechanics. Islander General Manager Bill Torrey was friends with former world champion pairs skaters Otto and Maria Jelinek, Czechoslovakians who had joined the Ice Capades. " Otto was always joking with me that figure skaters were stronger and better skaters than hockey players." Torrey said. " If you watch them, you'll see their stride is in perfect balance; and the better the balance the better you're going to skate and the better you are going to be able to shoot a puck or handle a puck". Bill Torrey loved Nystrom's heart and told him he had a plan. He said " I want to bring you back early before training camp during the summer, and I want you to take some power skating lessons. The Islanders finally hired skating instructor Laura Stamm to work with Bob during the summer. Stamm contends that Bob would have made it on sheer determination alone, but with some stride and speed pointers and lots of practice he became the influential player he was. Bob surpassed the 40-point mark eight times, and often led the team in penalty minutes. In 157 career playoff games, Bob tallied 39 goals and 44 assists, and remains sixth on the all-time Islander playoff scoring list. But it was for game tying and game winning goals that Bob would make his mark in National Hockey League history. CBC Hockey analyst Don Cherry admired Bob’s style of play and would always choose Bob to pot the winner. Bob did that on May, 24, 1980, at 7:11 of overtime against Philadelphia Flyer goaltender Pete Peeters winning the Islanders first of four straight Stanley Cup Championships. Over the next five years, Bob Nystrom would emerge as one of the leagues great playoff performers. He was a physical presence and opponents knew to stay clear of Islander stars Mike Bossy and Bryan Trottier. But Al Arbour also knew that Bob Nystrom could provide offensive spark and lead the team in the dressing room. Most especially, Bobby Nystrom embodied everything that used to be so special about sports that in these days of free agency have been long forgotten. A career Islander, he loved being a Long Islander and still does; now serving as the head of Islander Alumni. He was and is as much an image of the franchise, and Long Island, as any player in team history. You couldn't imagine seeing him in any other jersey, playing for any other team. Nine-hundred games after his NHL career was born during the same season the Islanders were in 1972-73, making him a true "original Islander," his name and famous No. 23 were retired to the Nassau Coliseum rafters in what was an emotional retirement ceremony. Emotional for Nystrom, his lovely family, the team, and his fans. 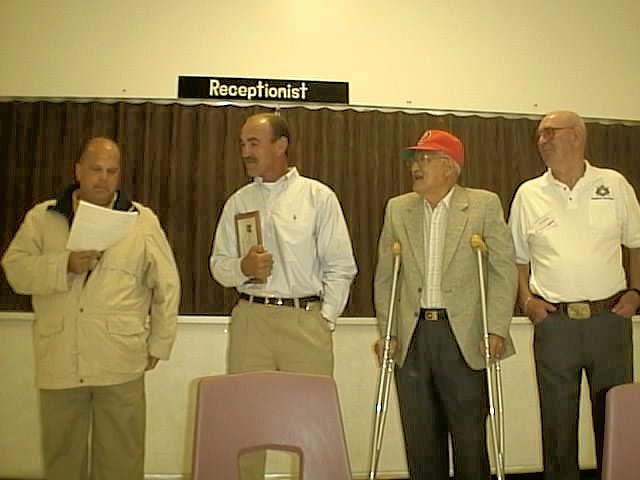 Bob was recently honored in his hometown , Hinton, Alberta, on their Sports Wall of Fame. He was the first athlete to be so honored. Nystrom is remembered fondly around the league as one of the greatest enforcers and team leaders ever. 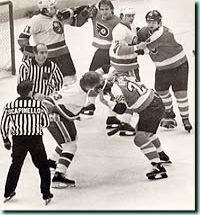 Tough Guy Tony Twist said, “"I think one of the better fight I've ever seen was between Curt Fraser and Bobby Nystrom. There are two guys who played with their hearts on their sleeves. Bobby Nystrom by far and away. I know Bobby wasn't a heavyweight, but as one of my all-time favorites, this guy came to the rink every night to play and gave his team everything. I've got a lot of respect for him." In his book, Dave Semenko also picks Bob as one of the best of all time. Semenko states that Nystrom never challenged Gretzky , Anderson or Kurri but rather "fought those players he should have. Nystrom was strong and tireless on the boards and I respected the way he played." said Semenko. Calgary Flame Coach and former teammate Greg Gilbert talked recently of Nystrom’s leadership: Gilbert said "I got my eyes opened one year when Bobby Nystrom did that with Denis Potvin, right at centre ice. Denis was (dogging it) in practice and Bobby and I didn't appreciate it because everybody else was (working hard)." When verbal reproaches had no effect on the Hall-of-Fame defenceman -- and the team captain, for crying out loud -- Nystrom really got angry. "Bobby went over, dropped the gloves and grabbed him and they wrestled," said Gilbert. This exemplified what it takes to win. I try to instill a lot of what I learned from Bob into my team's work ethic." Today, Nystrom, 50, is Vice President of Marketing for HRH Consulting Group, the 7th largest employee benefit consulting firm in the U.S.A.. Bob is an expert in developing both insured or self insured benefit programs for local and national companies, Bob is an independent broker, interacting with the insurance market or as a consultant in analysis, design and implementation. He is on the Board of Directors of A.C.I.T. and White Amber. In addition to the business world, Bob Nystrom is a strong family man and has been a tireless worker for charities and the Long Island community for thirty years. Even the communities of Edson and Hinton have seen his charitable contributions. He never forgot his roots and often sends items for Minor Hockey and school aged children. Many times when fans gain an opportunity to meet their sporting heroes they are disappointed because they are either brushed off by the player or they find that their idols are just ordinary citizens. I was lucky thirty years ago to choose Bob Nystrom as my sporting hero because he never let me down and still doesn't today. I saw him play in person only seven or eight times, but he always took time after the game to talk to us and sign autographs and even in the midst of the Stanley Cup finals in Edmonton took time to wave to us in the stands. After he retired and began working with the Islander Organization, Bob became a hero to kids who never saw him play. He gave up endless nights away from his family to cheer others and aide causes. He took time to speak to my students on the phone, send pictures to Hinton Minor Hockey players and twice travel all the way home to support Minor Hockey and The Hinton Sports Wall of Fame. 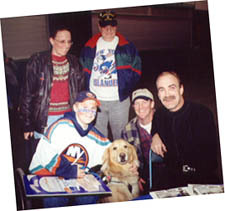 The New York Islanders and the Long Island community are lucky to have Bobby Nystrom in their community. Bobby Nystrom - de Hinton au N.H.L. Il était tout en accroissant vers le haut sur la commande de Sunwapta et portant son érable de Toronto pousse des feuilles le Jersey et encourageant pour les goûts de la Norm Ullman, ce Bob a rêvé la première fois du jeu dans le NHL. Une étoile defenceman pour Hinton, Nystrom tisserait souvent sa voie par la ligne d'adversaires juste de passer au loin à un teammate sur un filet ouvert. Déjà, à dix-sept, il était le joueur d'élite dans la ligue d'hockey de Pembina et le Bob mineur et un ami décidé pour essayer l'hockey de la rangée II en Colombie britannique, car aucune n'était maison proche disponible. Bob est resté deux ans avec les fusées de BCJHL Kamloops à côté de Grande Centre.s Garry Howatt avant d'être choisi en grizzly et l'entraîneur ampoulé de Calgary Centennials Scotty Munro. À Calgary, Bob a eu plaisir à jouer à côté de Jim McMasters et futur goaltender John Davidson de garde. La pensée Bob de Munro d'entraîneur serait un joueur mineur très réussi de ligue mais n'a pas vu probablement un futur lumineux dans le N.H.L. pour Bob. Les insulaires n'étaient pas certains dans le commencement non plus. Le marteau de Thor ils l'ont appelé pendant ces années tôt d'expansion; Nystrom peut avoir été un combattant impressionnant et a possédé un projectile éclatant, mais il n'avait pas gagné une pleine tache de rôle. Il ne pourrait pas patiner à la vitesse de NHL et à l'aide nécessaire avec la mécanique. La facture Torrey directeur général d'insulaire était des amis avec d'anciens patineurs Otto et Maria Jelinek, Czechoslovakians de paires de champion du monde qui avait joint la glace Capades. " Otto plaisantait toujours avec moi que la figure patineurs étaient des patineurs plus forts et meilleurs que des joueurs d'hockey. " Torrey dit. " Si vous les observez, vous verrez leur pas est dans l'équilibre parfait; et plus est meilleur l'équilibre plus vous allez mieux patiner et plus vous allez pouvoir tirer un galet ou manipuler un galet mieux ". La facture Torrey a aimé le coeur de Nystrom et dit lui l'a eu un plan. Il m'a dit " veulent vous rapporter tôt avant camp de formation pendant l'été, et je veux que vous prenniez quelques leçons de patinage de puissance. Les insulaires ont finalement employé l'instructeur de patinage Laura Stamm pour travailler avec Bob pendant l'été. Stamm affirme que Bob l'aurait rendu sur la détermination fine seul, mais avec quelques indicateurs de pas et de vitesse et un bon nombre de pratique il est devenu le joueur influent qu'il était. 40-point huit fois, et a souvent mené l'équipe en minutes de pénalité. Dans 157 jeux de playoff de carrière, Bob a correspondu 39 buts et 44 aides, et restes sixième sur la liste de marquage de playoff absolu d'insulaire. Mais elle était pour attacher de jeu et des buts de gain de jeu que Bob ferait sa marque dans l'histoire nationale de ligue d'hockey. L'analyste d'hockey de CBC met le modèle de Bob.s admiré par cerise du jeu et choisirait toujours Bob dans le pot le gagnant. Bob a fait cela mai, 24, 1980, à 7:11 d'heures supplémentaires contre le goaltender Peter Peeters d'insecte de Philadelphie gagnant les insulaires d'abord de quatre championnats droits de tasse de Stanley. Au cours des cinq années à venir, Bob Nystrom émergerait en tant qu'un des grands interprètes de playoff de ligues. Il était une présence physique et les adversaires ont su pour rester dégagés du microphone d'étoiles d'insulaire autoritaire et du Bryan Trottier. Mais Al Arbour a également su que Bob Nystrom pourrait fournir l'étincelle blessante et mener l'équipe dans la salle s'habillante. Le plus en particulier, le policier Nystrom a incarné tout qui était si spécial au sujet des sports qui dedans de nos jours de l'agence libre ont été longs oubliés. Un insulaire de carrière, il a aimé être un long insulaire et toujours; maintenant servant de tête des anciennes élèves d'insulaire. Il était et est autant une image de la concession, et longue île, en tant que n'importe quel joueur dans l'histoire d'équipe. Vous ne pourriez pas imaginer ne le voir à aucun autre Jersey, jouant pour aucune autre équipe. Les jeux de Nine-hundred après que sa carrière de NHL ait été soutenue pendant la même saison les insulaires avaient lieu en 1972-73, faisant lui un véritable " insulaire original, " à son nom et à numéro célèbre 23 ont été retirés aux combles de Nassau Coliseum dans ce qui était une cérémonie émotive de retraite. Émotif pour Nystrom, sa belle famille, l'équipe, et ses ventilateurs. Bob a été récemment honoré dans sa ville natale, Hinton, Alberta, sur leur mur de sports de la renommée. Il était le premier athlète à être ainsi être honoré. On se rappelle tendrement Nystrom autour de la ligue en tant qu'un des plus grands enforcers et chefs d'équipe jamais. La torsion dure de Tony de type a indiqué. " Je pense un au combat meilleur que j'ai jamais vu étais entre Fraser brusque et policier Nystrom. Il y a deux types qui ont joué avec leurs coeurs sur leurs douilles. Policier Nystrom de loin et loin. Je connais le policier n'étais pas un heavyweight, mais en tant qu'un de mes favoris absolus, ce type est venu à la patinoire chaque nuit pour jouer et a donné à son équipe tout. J'ai beaucoup de respect pour lui. " En son livre, Dave Semenko sélectionne également Bob en tant qu'un des meilleure de toute l'heure. Semenko déclare que Nystrom n'a jamais défié Gretzky, Anderson ou Kurri mais " a plutôt combattu ces joueurs qu'il devrait avoir. Nystrom était fort et inlassable sur les conseils et moi a respecté la manière qu'il a jouée. " ledit Semenko. L'autocar de flamme de Calgary et l'ancien teammate Greg Gilbert ont parlé récemment de la conduite de Nystrom.s: Gilbert m'a indiqué " a obtenu mes yeux a ouvert un an quand le policier Nystrom a fait cela avec Denis Potvin, droite à la glace de centre. Denis était (le poursuivant) dans la pratique et policier et je ne l'ai pas apprécié parce que tout le monde était autrement (travaillant dur). " Quand les reproches verbaux n'ont eu aucun effet sur la Hall-de-Renommée defenceman -- et le capitaine d'équipe, parce que pleurer dehors fort -- Nystrom est vraiment devenu fâché. " Le policier est allé plus de, a laissé tomber les gants et l'a saisi et ils ont lutté, " ont dit Gilbert. Ceci a exemplifié ce qu'il prend à la victoire. J'essaye d'instiller beaucoup de ce que j'ai appris de Bob dans l'éthique du travail de mon équipe. " Aujourd'hui, Nystrom, 50, est le vice-président du marketing pour le groupe de consultation de HRH, la société de consultation du 7ème plus grand avantage des employés aux Etats-Unis. Bob est un expert en matière d'assurés se développants ou les programmes sociaux d'assurés d'individu pour les compagnies locales et nationales, Bob est un courtier indépendant, agissant l'un sur l'autre avec le marché d'assurance ou en tant que conseiller dans l'analyse, la conception et l'exécution. Il est sur le conseil d'administration d'A.C.I.T. et d'ambre blanc. En plus du monde d'affaires, Bob Nystrom est un homme fort de famille et a été un ouvrier inlassable pour les charités et la longue communauté d'île pendant trente années. Même les communautés d'Edson et de Hinton ont vu ses contributions charitables. Il n'a jamais oublié ses racines et envoie souvent des articles pour l'hockey mineur et les enfants âgés par école. Beaucoup de fois quand les ventilateurs gagnent une occasion de rencontrer leurs héros sportifs ils sont déçues parce qu'elles sont balayées au loin par le joueur ou elles constatent que leurs idols sont juste les citoyens ordinaires. J'étais il y a des trente ans chanceux pour choisir Bob Nystrom en tant que mon héros sportif parce qu'il jamais ne m'a vers le bas laissé et pas toujours aujourd'hui. Je l'ai vu jouer chez la personne seulement des sept ou huit périodes, mais il a toujours pris du temps après que le jeu à parler nous et aux autographes de signe et à même au milieu des finales de tasse de Stanley à Edmonton ait pris du temps d'onduler à nous dans les stands. Après qu'il se soit retiré et ait commencé à travailler par l'organisation d'insulaire, Bob est devenu un héros aux gosses qui ne l'ont jamais vu jouer. Il a renoncé des nuits sans fin loin de sa famille à l'acclamation à d'autres et à des causes d'aide. Il a pris du temps de parler à mes étudiants au téléphone, envoie des images aux joueurs mineurs d'hockey de Hinton et voyage deux fois toute la manière de soutenir à la maison l'hockey mineur et le mur de sports de Hinton de la renommée. Les insulaires de New York et la longue communauté d'île sont chanceux pour avoir le policier Nystrom dans leur communauté.